When you’re just starting out as a homebrewer, the creations you brew will probably come from well-known, time-tested beer recipes. But as your skills grow and your brewer’s toolkit expands, you might find yourself inspired to create your own recipes. Everybody has their favorite homebrewing setup and preferred style. Designing or adapting beer recipes takes a little bit of math, effort, and time. But it’s easier than you might think, and crafting a beer that’s truly your own is about more than bragging rights. Understanding what goes into a great beer, and how to brew it in batches big or small, can help you develop stronger skills at every step of the brewing process. When you’re drafting (ha!) tasty and well-developed homebrew recipes, science and artistry go hand in hand. Thanks to the internet, it’s easy to hop (double ha!) online and use a widget to crank out a recipe. 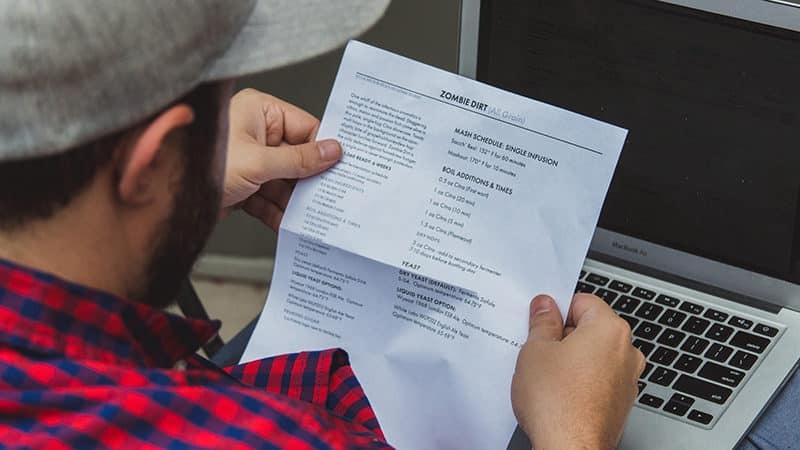 It’s fast, generally foolproof, and makes it easy to keep notes. But if you’re into the nuts and bolts of homebrewing, understanding the why as well as the what of the recipe will help you gain the skills you need to fine-tune recipes you love and eventually craft your own. Don’t get too nuts, of course. This is no time to channel your inner Swedish Chef. Keep fundamental concepts like size, style, technique, and purpose in mind, and build a great beer from the ground up. 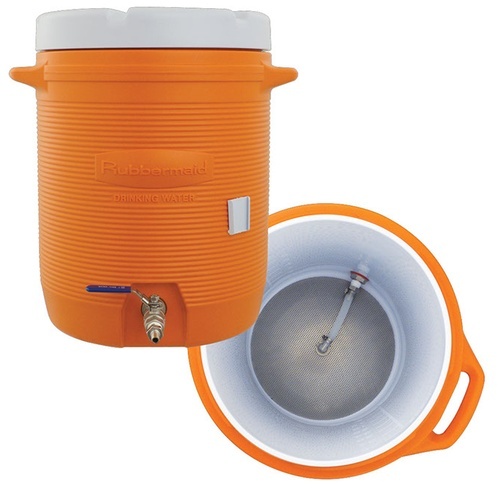 You’ve probably noticed the standard batch size for most homebrew recipes hovers around 5 gallons If you click this link and make a purchase, we earn a commission at no additional cost to you. (19 liters). It makes sense when you consider how standard equipment like carboys and kegs are sized to accommodate batches of this size. Consider this a starting point, especially if you’re new to creating beer recipes. You get around two cases of beer when all is said and done, which is enough to enjoy without having to turn the living room into a walk-in cooler. Of course, if you’re working with special ingredients or testing out a new recipe, you’ll likely go with a smaller batch anyway. On the other hand, maybe you specialize in one kind of beer. Maybe you can’t, or don’t have time, to brew as often as you like. Brewing 10 gallons If you click this link and make a purchase, we earn a commission at no additional cost to you. (38 liters) of a beer you love makes sense if you’re pressed for time, but have the gear and storage space to make it happen. Whatever your ultimate goal is for your homebrew recipes, starting with a 5-gallon (19-liter) batch makes it easier to create a good beer. In homebrewing, as in fine cuisine, happy accidents happen all the time. Who, after all, could’ve predicted the weirdly successful persistence of Chili Beer? But for every unlikely success story, a hundred Swedish Chef horky-bork-bork beers go quietly to their graves. So. What the heck do you think you’re doing? No, seriously, we want to know. Is this a pilot batch for a beer that’s still in the works? Are you adapting an old favorite to produce more bitterness, a darker color, more alcohol? Are you experimenting with the bitter aromatics and flavors of noble hops? Or is this a brand-new brew, destined to shake the foundations of the homebrewing community? Note the flavors, strength, color, and finish you’re after. Feel free to take inspiration from other beers you already love. Keep your brew’s intended destination firmly in mind, and you won’t end up with a beer that’s all over the place. Keep it simple, sweetheart. That’s the slightly politer version of a saying that was already old when Moses was in swaddling clothes (they made beer back then, too). Simplicity is important to successful beer recipes. The fewer ingredients you use, the more focused your finished beer will be. 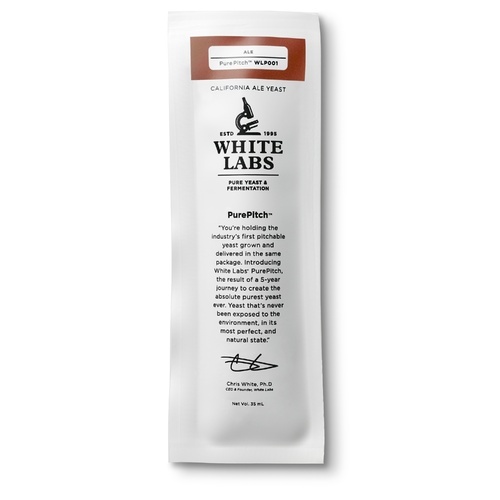 Using the fewest ingredients possible also lets you evaluate your beer more effectively. You’ll be able to trace any funky flavor or mouthfeel issues much more easily if you’re not trying to figure out if it was the malt, the lavender, or the packet of tartar sauce. Many styles of beer have traditional yeasts, malts, and sugars considered essential to their creation. So if, for example, you want to create a recipe that captures the essence of a good Bavarian Hefeweizen, you’d use wheat for at least 50% of your grain bill, German hops, and a yeast that produces the fruity esters that give this style of beer its hints of clove and banana If you click this link and make a purchase, we earn a commission at no additional cost to you. .
You can familiarize yourself with various grains, yeasts, and hops by poring over the books, but the best way to learn is by pouring yourself a cold one. Taste the beers you want to recreate or emulate, and get to know their ingredients. You’ll find an informed palate is a handy tool for building a better beer. If you’re new to designing beer recipes, make like the Hulk and SMaSH (Single Malt and Single Hop) your brew. This homebrewing method limits you to just one type each of malt and hops, keeping things lean and clean. Think of your SMaSH brew as the template for your beer. You can always add one or two adjuncts to create a flavorful homebrew with herbs and spices, or mix things up by trying different varieties of hops at different stages of the brew. But establishing a core recipe with the fewest possible ingredients gives you a solid canvas for creating your next masterpiece. Ingredients aren’t the only traditional components of well-established beer styles. If you take another look at that tasty wheat-forward Hefeweizen, for example, you’ll note that beers in that style are traditionally brewed with a decoction mash. 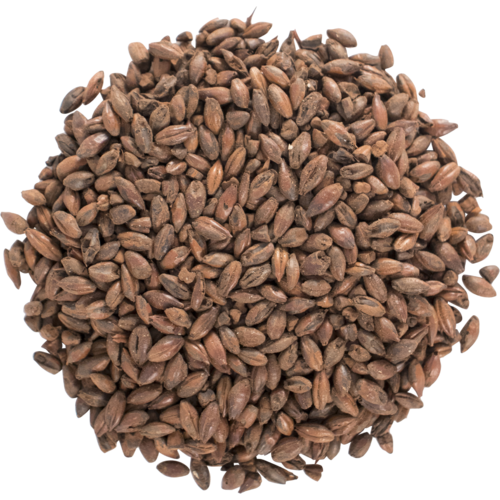 If you want the same malt-rich and clove-y flavors in your beer using a single infusion mash, you might need to modify your ingredients or mash to make the recipe work. Beyond specific style concerns, think about execution. 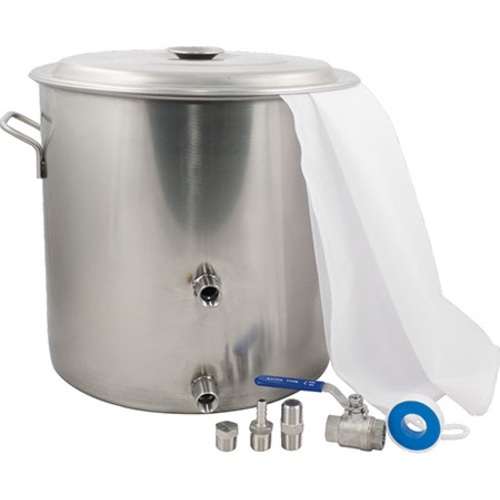 Your 20-gallon batch size might make a lot of beer, but it’s probably not suited for a brew in a bag setup If you click this link and make a purchase, we earn a commission at no additional cost to you. without modifications, like a crane and Paul Bunyan’s tea cup. Chances are, some other intrepid soul in the homebrewing universe has already come up with a pretty delicious version of whatever beer you want to brew. But as our good pal Pablo Picasso may or may not have said, “Good artists copy. Great artists steal.” Just because someone else has already created, for example, a recipe for strong red ale If you click this link and make a purchase, we earn a commission at no additional cost to you. doesn’t mean you’re stuck with their version, or that you can’t improve upon it. Having already carefully considered your goals and ingredients for your recipe, you have a pretty good idea of what you want for your finished beer. Consider existing homebrew recipes to be jumping-off points. Brace yourself. We’ve got a secret for you: there’s no such thing as a perfect beer recipe. Now, before you begin drafting an angry email titled “How Dare You, My Cinnamon Chocolate Stout is a Gift from Dionysus Himself,” hear us out. Every recipe has room for customization and improvement. So don’t get intimidated by the long, multi-millennial history of homebrewing when you sit down at your PC or pick up your pencil. Your recipe may not be perfect, but neither was the one that inspired it. That doesn’t mean it won’t be delicious. Besides, perfection is overrated in our book. To provide a basic example of how you might draft a new beer recipe, let’s start with one you already love. Let’s say you’re a huge fan of IPAs and would like to put your own twist on a classic. GRAIN BILL: 12 lb. (5.4 kg) Maris Otter If you click this link and make a purchase, we earn a commission at no additional cost to you. California Ale V If you click this link and make a purchase, we earn a commission at no additional cost to you. Mash for 60 minutes at 151°F (66°C). Boil for 90 minutes. This IPA is simple, easy to replicate, and tastes great. But maybe you want to mix things up with Cascade If you click this link and make a purchase, we earn a commission at no additional cost to you. or Citra If you click this link and make a purchase, we earn a commission at no additional cost to you. 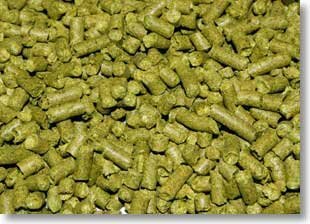 hops, or use extract brewing instead of rolling out the mash tun If you click this link and make a purchase, we earn a commission at no additional cost to you. .
You decide to create your own version by modifying the recipe with a partial mash. So you drop the 12 lbs. 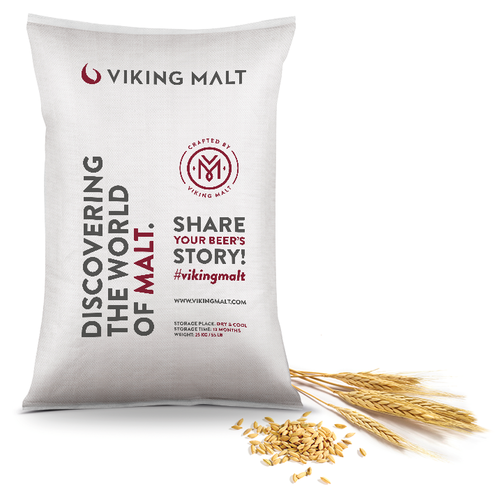 (5.4 kg) of Maris Otter malt If you click this link and make a purchase, we earn a commission at no additional cost to you. to 5 lb. (2.3 kg), and then add an additional 5 lb. (2.3 kg) of Maris Otter extract to make up the difference. You also decide to add fresh orange zest for a citrusy boost, dropping in 2 oz. during the last five minutes of the boil. Et voilà! You’ve created your own recipe without too much difficulty. Your substitutions will produce a similar, but distinct, version you can proudly call your own. If you’re concerned about hitting your targets, plug your recipe into the online calculator of your choice to test your math and make sure you haven’t wandered too far afield. Note: Replacing ingredients may change the gravity, color, or finish of the beer. And if you’re adding new techniques, using malts, yeasts, or hops outside the style’s profile, or want to add something new, like cinnamon or orange peels, you’ll definitely want to make special note of that in the instructions. This method requires more time, knowledge, and effort than modifying an existing one, since you need to know more about the ingredients. But creating a beer recipe from scratch also lets you experiment quite a bit more. For a simple beer built from the ground up, revisit the basics of a good beer recipe. Let’s say you want to brew a 5-gallon (19 liter) batch of stout. You want it to be dark, malty, and have a few hints of chocolate and char. You prefer to mash your grains, and you’ve chosen an all-purpose ale yeast If you click this link and make a purchase, we earn a commission at no additional cost to you. as your fermenter If you click this link and make a purchase, we earn a commission at no additional cost to you. . Your grain bill has three components: a base malt of Pale Malt (6 row), chocolate malt If you click this link and make a purchase, we earn a commission at no additional cost to you. , and roast barley. Your base malt will contribute 90% of your fermentables, while the other two will provide 5% each. You know you want to make 5 gallons of beer, and you’ve chosen a reasonable 1.070 OG, well within the proper range for stouts. Your target FG, also based on the range for stouts, is 1.017. You take careful notes, so you already know your overall brewhouse efficiency is an impressive 75%. Armed with this information, you can work a little mathematical magic and figure out your grain bill. First, calculate your total gravity units. You do this by multiplying the number of gallons in your finished batch (5) by the gravity units in the OG. In this case, an OG of 1.070 means your beer has 70 gravity units. Now, break down each fermentable’s contribution by multiplying its percentage by the total number of gravity units. Hold tight, we’re almost there. Plug in the potential yield for each fermentable. You can find these values either on the packaging or by using an online grain list. Finally, divide the total gravity units for each fermentable by the potential yield, and then again by your brewhouse efficiency to get the amount of each fermentable you’ll need to brew a 5-gallon batch of homebrew. Add ’em all up, and your total grain bill is 13.76 lb. (6.2 kg). You’ve settled on a mash temperature of 154°F (68°C) and a sparging temperature of 170°F (77°C). You plan to batch sparge to ensure optimal efficiency and get as many sugars as possible into your wort. With a target batch size of 5 gallons, you’re figuring on around 6.5 gallons of pre-boil wort to hit your target size, gravity, and finish. You’ve chosen mild Cascade hops for both bittering and flavor, since you don’t want them to overwhelm the toasty flavors of your stout. Like all beer recipes, this is a good place to start, but the proof will be in the stein. You can be as fancy or plainspoken as you like when writing down your recipe, but make sure you cover all the relevant information for anyone who’d like to try replicating your homebrew. Note: We recommend brewing up a batch, following your own instructions and ingredients, and then making tweaks for clarity and taste, flavor, color, etc., before you send it out into the world. The goal is not just to make great beer, but to be able to make it again and again. .83 lb (.38 kg) Chocolate malt If you click this link and make a purchase, we earn a commission at no additional cost to you. California Ale yeast If you click this link and make a purchase, we earn a commission at no additional cost to you. Hold mash at 154°F (68°C) until conversion is complete, and mash out at 168°F (76°C). Sparge with 170°F (77°C) water, collecting 6.5 gallons (25 L) of pre-boil wort. Test gravity to ensure it is at or near 1.070. Boil for 90 minutes. Add the bittering hops at 60 minutes remaining in the boil. Add the remaining hops when 15 minutes remain in the boil. Chill the wort to 67°F (19°C) and aerate well. Pitch according to directions on the packet and ferment at 67°F (19°C), and hold another two days after signs of fermentation cease. Target a carbonation level of 2.5 volumes. You’ve chosen your fermentables, yeast, sugar If you click this link and make a purchase, we earn a commission at no additional cost to you. , and adjuncts. You’ve decided how you want to brew, and whether you’re going to bottle or keg. But maybe you need to make a small batch to test out a new ingredient. Maybe your family has an Oktoberfest party, and you need to make 20 gallons of your famous homebrew to appease the crowd. Whatever the reason, adjusting your existing recipes for other sizes is a fairly simple process. One of the easiest ways to modify a recipe, whether it’s from scratch or an existing favorite, is to use an app. Tools such as BeerSmith let you adjust your recipe not just for batch size, but to maintain characteristics like bitterness, gravity, and color. It doesn’t matter if you want to take a recipe from a small batch to a large, or shift down a pro-style brew for your home rig. The high tech route gives you a straightforward and convenient way to get the beer you’re after. Math is like jogging to work. Sure, it gets you there, and it’s probably good for you, but at what cost? Our longtime distaste for needless number-crunching aside, some quick calculations make it easy to adjust beer recipes, even if you’d rather give up and go raise llamas than mess with math. Proportional scaling is just what it sounds like. You take the ratio of the new batch to the old, and apply it to the ingredients you’re using. So if you want to brew your 5-gallon batch recipe but only make 3 gallons, you’d multiply all your ingredients by ⅗. Note: This method is a little more brute-force than using an app, and it doesn’t necessarily take into account different equipment or techniques. This is especially true if you’re upsizing, since you’ll need more water and your standard equipment might not be able to handle the mash or boil load. Proportional scaling is good for general calculations, but if you’ll get more precise results, and more options, with an app. Why settle for someone else’s brew when you can design your own? Whether you’re starting from scratch or taking inspiration from an existing beer, delicious homebrew recipes are within your reach. Respect your ingredients, set clear goals for your brew, and keep expanding your knowledge of malts, yeasts, sugars, and extracts. You’ll soon be savoring exceptional beers you’ll be proud to call your own.